Description: The Irish Field was established in 1870 and is Ireland’s only newspaper dedicated to racing and equestrian sports. The paper is published every Saturday and is a must-read for all equine fans. 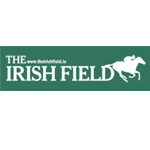 The Irish Field covers all thing equine, from latest racing, breeding and sport horse news to reports and results from the point to point scene. The Irish Field is part of the Agricultural Trust, which also publishes the Irish Farmers Journal, Irish Country Magazine and Irish Country Living.